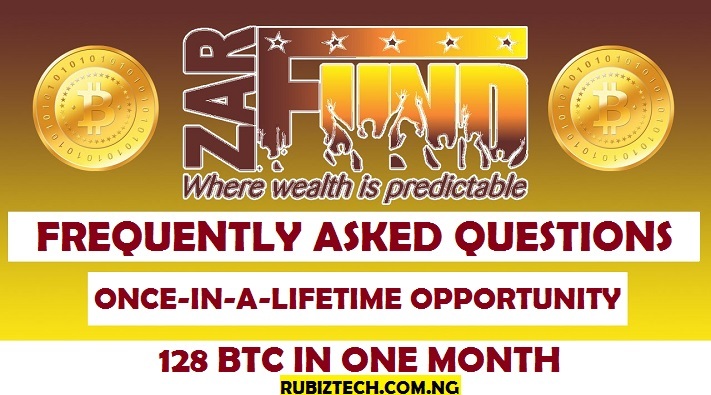 Zarfund is the fastest growing bitcoin investment that many worldwide can easily go into. If you are looking for the best and legit ways to make money online, Zarfund is you sure answer. We have given a complete Zarfund review, step-by-step picture and video guide which you may want to check out first. Like every serious business minded person, there are basics you will need to know about Zarfund. Although as simple as this program seems, many newbies still find it difficult operating Zarfund account from their back-end. This as generated many frequently asked questions (faq) as long as Zarfund matrix system runs, the FAQ will become a mantra for every investor to chant. Q. How does ZARFUND work? A. When you join ZARFUND you join a community of like-minded members who are interested in donating a certain amount to an up-line to get a donation from downlines. Q. How do I join ZARFUND? A. Get in touch with the rubiztech or use click here to sign up. Then use this guide to upgrade to your first level. Q. Is ZARFUND available worldwide? A. Yes, ZARFUND is available to anyone with an internet connection, a Bitcoin wallet and the willingness to become a member. Q. What is Upline / Downline? A. Upline is your referral, downline is the person(s) you refer or those placed under you automatically by your team. Q. What pay processors are used? A. Zarfund only uses Bitcoin to make it easy for members to pay. A. Bitcoin is a type of digital currency in which encryption techniques are used to regulate the generation of units of currency and verify the transfer of funds, operating independently of a central bank. A. This is more like a bank account, where your bitcoins are stored. A. The only place we highly recommend you go get a Bitcoin wallet is at https://blockchain.info. A full guide has been provided here. Q. How will I withdraw my earnings? Q. Can I have more than one Zarfund account? A. Yes! you can but it is strongly recommended that you do not stack them. For example, you create another personal account under your first account. This is considered stacking. This is an unethical practice. A. All payments happen between members and it is up to members to reach an agreement amongst themselves if they allow refunds or not. Meanwhile, refunds for what? No one is ever going to get duped. Q. When do I upgrade to next level? A. You should upgrade to the next level the moment you are able to so that you don’t miss out on payments coming to you for those levels from your downlines. Q. Are you allowed to upgrade even though your level is not filled up? e.g to be on level 3 you must have 8 downlines, does that mean you have to get exactly 8 before upgrading to level 4? A. You can upgrade at any time, the sooner you are able to the sooner you know you will not miss out on any subscription payments. A. Everyone can have their own unique experience in the system. It is best to upgrade the moment you are able to. If you don’t you will miss payments for the levels you have not upgraded to if there are members below you on those levels who upgrade fast. Q. When will two people be assigned to me? I was under the impression that as each person (which has grown since I joined) joins they are assigned to each person and so forth under my level? A. YOU will need to find your own two people to join you and you can then help them find their 2 people to grow your team. Don’t rely on or expect spillovers. Q. Isn’t this like a pyramid scheme? A. Well, a pyramid scheme means that only the top members of the hierarchy get paid whereas ZarFund allows every member to earn the same amount by doing the same amount of work. You can receive more payments than the person who signed you up. A. There are a few factors that will influence which signup page you will see. 1) You will need to be signed out. 2) You will need to use the link of the person you want to sign up with. If you see the Admin link then you’ve not followed the previous 2 rules or you might need to clear your cookies. Q. Can I use the same IP address to help my team to open accounts for multiple people? A. Yes! You may as long as you don’t stack accounts. Q. What happens if I don’t upgrade? A. If you don’t, then the subscriptions that would have come to you, for that particular level, will bypass you and go up to your level 1 upline, if they are qualified. For example: If someone on your level 3, in your matrix, is either upgrading to level 3 or is paying their monthly subscription for level 3, if you are qualified, you will receive that payment. If you are not yet on level 3 or you are in arrears on your level 3 subscription, the payment will bypass you and go to your level 1 upline, if they are qualified to receive a level 3 subscription payment, meaning they are already on level 3 and they are current with their level 3 subscriptions. It works the same way with the regular upgrades and the subscriptions… so don’t get skipped! Question: Do I need to pay upgrade fee again after the initial 0.03 BTC/ $20? But other upgrade fees will not be coming from your pocket again. Rather, you shall be upgrading from the profits made after receiving payments from people assigned to pay you. See payment proof. Question: How do I know exact when to upgrade. Answer : Upgrade immediately you receive complete expected earning for the given stage you currently are. Question: How much do I upgrade with each time. Question: How much do I earn at each stage. showing the number of people, how much each pays, total expected earnings in BTC / Stage. Question : I have to visit www.blockchain.info after every upgrade payment? Hence you need to keep this instruction manual safe for your reference. Question: How do I monetize/sell my BTC. Question: Why do we all need to promote a single referral link Called the team’s link. Answer: This is because the strategy will no doubt help our team grow so rapidly that the final stage which is stage 6 can be reached in a very few week. After all, the result that can be achieved through our combined effort will by far surpass what we can achieve individually. This will help us cover the inadequacy/inability of any team member who might not be able to refer anyone. Thus through team efforts, everyone is a winner. Remember the saying ” A TEAM WILL ALWAYS WIN WHEN NO ONE CARES WHO TAKES THE GLORY. Question: What happens when one reaches stage 6. Answer: Since stage 6 is the final stage, and the total earnings for this stage are known. The system locks you out the moment you receive the complete earnings for this stage. Question: Is this opportunity a one-time only opportunity? Answer: No. Once you circle out. You are legally free to re – enter. question:- my level 2 members(4) when they wanted to upgrade to stage 2 they are donating MONEY to their respective upliners …how iam going to get profit of 0.20 btc from level 2…….level 1 members are getting profit of 0.20 to each. 0.10 to one and 0.10 to other where is my profit dammit……. You will need to understand how zarfund work to know when and how you get your profits.